Last week, I was attempting to put together a proposal for some informational materials on innovation and intellectual property. I spent a good deal of time trying to understand the points that would be most interesting and enlightening for anyone who might wish to learn more about these topics. As I am a firm believer in the “one picture is worth a thousand words” concept, I also looked at the usual analogies and illustrations that are typically employed. I then realized that there were two leading visuals most often used in this context—the “idea funnel” and the “innovation pipeline.” Upon reflection, I realized that simplistic use of either might result in naïve expectations. 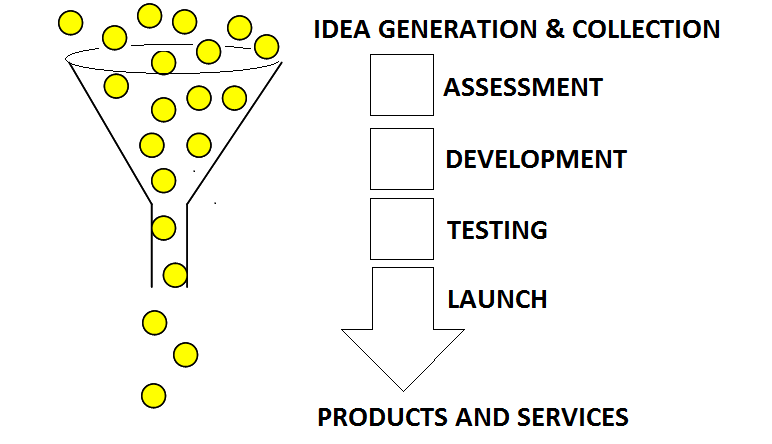 The use of the idea funnel is normally used to show how multiple ideas are “poured” into an organization, and come out the other end as “innovative” products or services. Normally, it looks something like this when used as a graphic. Typically, this is meant to portray that many ideas enter the funnel, but just a few “come out” as products. However, this isn’t the entire message—note that this graphic at least gives the impression that all the ideas going IN might (or must!) come out the other end. In most cases, the “assessment” stage, or the “testing” stage are intended more as “filtering” processes, which actually REMOVE some of the ideas from the eventual flow out of the funnel. 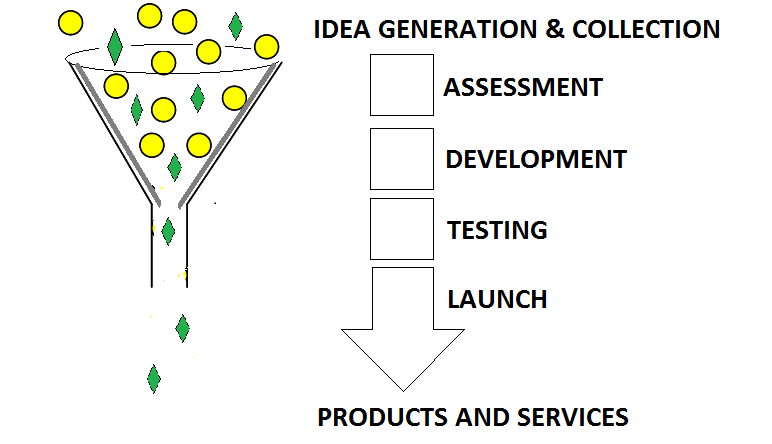 In this version, the inserted filter has a smaller opening, such that not everything can pass through, and the “ideas” are shown as two different types—ones that will not pass through (the ideas that do not successfully pass the assessment or testing stages, for example) and the ones that eventually come out as products. This one does a pretty good job of showing how much of the “input” (in the form of ideas and resources) comes together, resulting in the “outflow” at the end. There are even “leakage” points to show that some of the inputs result in non-desired output or loss. But use of the “pipeline” concept in general may be no better than that of the funnel. Several features of this diagram are noteworthy. First, the “input” water supply feeds into a main “control” feature (in this case the water meter). Some of it is diverted to a water heater, so that there is an extra level of “functionality” now available. Then, there are lines leading to several points of “use” for the water supply–thus, input material is converted into some form of “product.” Some of these might be considered a higher value product (use in the kitchen sink where it might be consumed as a drink, or the washing machine perhaps, where it transforms dirty laundry into clean clothing). Other uses are still essential but are “lower tech” such as the use in the bathroom sink or toilet (where most of the input flows down the drain and is “wasted” in the process). 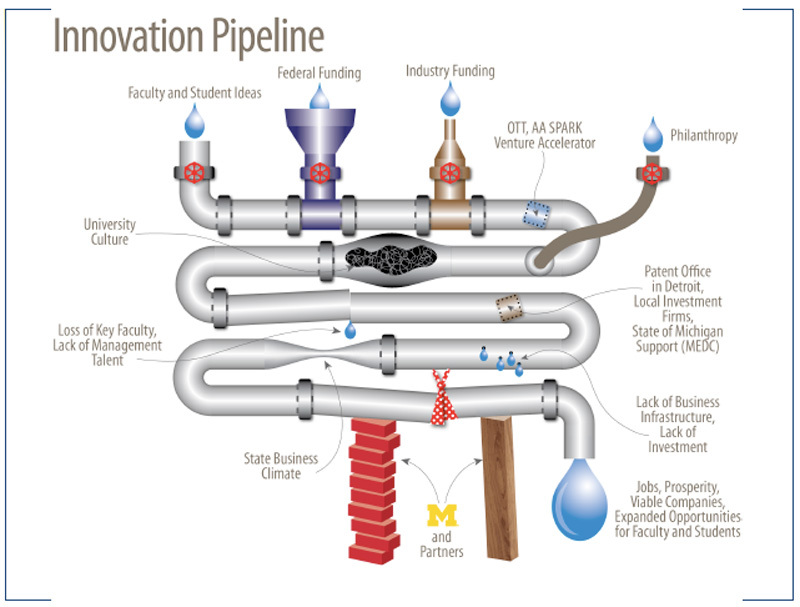 I was tempted to generate the plumbing graphic illustrating the university innovation/technology transfer process, but my skills as an artist are limited. Obviously, there are also shortcomings to this conceptualization. The water supply, naturally, represents the flow of ideas from faculty, students, etc., and into the “system.” Perhaps the “water meter” would represent the technology commercialization office, and the water heater might represent the patent protection process. But what about further “upstream” for the supply? Is there a “pumping” mechanism? Is there a larger reservoir such that only a portion of the “supply” makes it into the system? In the end, the usefulness of this sort of graphic is in communication—giving a common frame of reference for an activity or process that everyone needs to understand. Since these are often used as a means of directing a group to higher levels of efficiency or success in the process, it is important that the key sources of inefficiency, or barriers to success, are illustrated appropriately. These must be conceptualized in a fashion that also envisions the key to proper flow and management of the process, and in particular, to help the audience understand the points at which problems might be encountered, and how these might be overcome. Otherwise, it is possible to leave the audience with just a pretty picture, and without insight for change.